A plank cross-section displaying the unique tapered sides and anti-warp groove which reduces the tendency for individual boards to pond water, further enhancing safety and longevity. Outdoor Structures Australia is proud to announce it has been granted membership into the Australian Technology Showcase for its innovative Deckwood and LifePlus® Decking products. Deckwood for Boardwalks brochure ›(680KB PDF brochure). Producing quality timber products for local and international markets, Outdoor Structures Australia has gained invaluable practical experience in Commercial decking, enabling them to provide total solutions for any timber need. Fully weather-exposed deckwood is an unseasoned hardwood product designed for commercial decking applications. Typical uses include decking, bridging, marinas, loading docks, boardwalks and park furniture. When timber is used outdoors in public and commercial situations, exposed to the elements without the protection afforded by roof or paint systems, durable hardwood is the ideal product. Until now it was difficult to find a hardwood producer dedicated to supplying timber suitable to withstand the rigours of the "Great Australian Outdoors". Outdoor Structures Australia has developed a full understanding of the correct application of hardwoods, especially when used externally in public works. The company is a pioneer in the production of quality hardwood prefabricated bridges, boardwalks and park furniture. 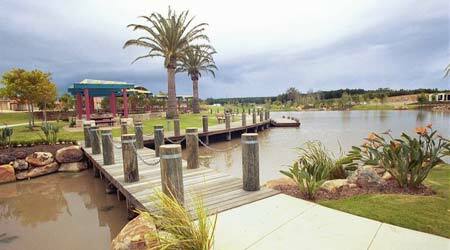 Outdoor Structures Australia runs a Quality Assurance programme for its hardwood production, including Deckwood. 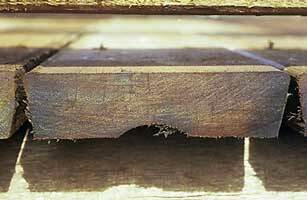 Read of the advantages of spotted gum deckwood as decking material. Deckwood has a superior top face and is selected only from species suitable for exposed applications. The sizes and species offered have been chosen to minimize cupping and to reduce differential shrinkage that otherwise could lead to problems near fasteners.